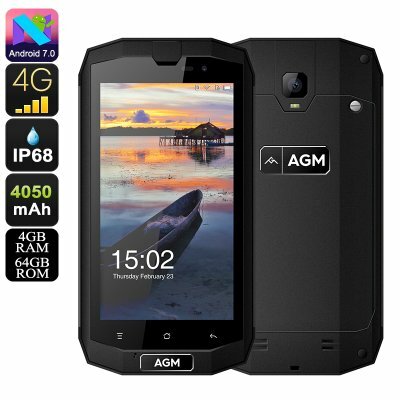 Successfully Added AGM A1Q Rugged Smartphone - Android 7.0, Quad-Core CPU, 4GB RAM, Dual-IMEI, 4G, NFC, IP68, Gorilla Glass 3, 13MP Camera to your Shopping Cart. The AGM A1Q rugged phone is an extremely durable Android smartphone that will follow you during all your upcoming adventures. Thanks to its tough IP68 rated design, this Android phone is resistant against water, dust, and drops. This makes the cell phone perfect for outdoor enthusiasts and people working in rough environments. Its 5-Inch display has been equipped with Gorilla Glass 3. This makes your screen resistant against scratches and merely impossible to break. No matter where you’ll head next, the AGM A1Q will always keep you connected. This rugged smartphone comes with two SIM card slots and dual IMEI numbers. This makes your cell phone perfect for separating work and private life. Additionally, it supports 4G. With access to the fastest data speeds out there, this Android smartphone keeps you connected at all times. Along with its Android 7.0 operating system, a smooth user experience is guaranteed while enjoying all the latest software features available. The cell phone furthermore supports NFC. This feature will increase your overall experience and allows you to engage in different activities such as completing wireless transactions via your smartphone. Within its IP68 rated body, this rugged phone packs some significant power. A Quad-Core CPU that has been clocked at 1.2GHz allows you to enjoy mobile games and Apps. Additionally, the phone also holds 4GB RAM thanks to which you’ll be able to engage in demanding multitasking sessions. With 64B of internal storage, there is plenty of space to store your personal files. For those of you that need even more memory, the phone holds a 32GB SD card slot. Access to the Play Store allows you to effortlessly download millions of the latest Applications. With this smartphone in your pocket, you’ll always be able to carry along hours’ worth of entertainment. A large 4050mAh battery brings along 10 hours of continuous usage time. It furthermore supports up to a stunning 10 days of standby time. The next time you head out in the wild, you’ll no longer have to worry about running out of juice. With this Android smartphone, you’ll always stay connected. In order to take the most out of your upcoming adventures, your rugged phone comes with a 13mp rear camera. This piece of equipment lets you snap breathtaking images to recall all those special moments.